A serious companion for every day! Garmin Vívomove HR. The Garmin widens its range of watches with the Vívomove HR. Under the guise of a consumer design, this watch offers measures useful to everyone, but also casual sportsmen. 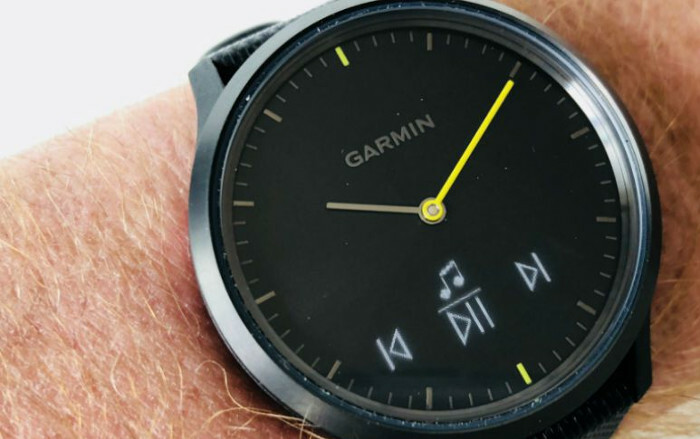 The Vívomove HR watch from Garmin is, according to the definition of its manufacturer, nothing less than a " hybrid smartwatch with hidden digital screen " (sic!). In fact, the Vívomove HR tries to find its place in a growing niche. 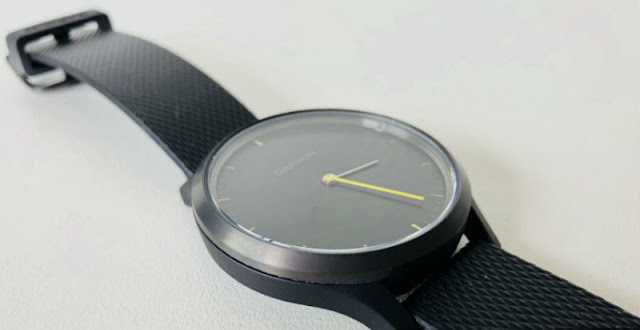 Neither a watch nor a watch connected to OS for tocantes, the newcomer wants to register on a segment that could be located between the watch Nokia Steel HR and watch Fossil Q Commuter. This is where the builder comes to find a clientele not necessarily very sporty, who wants to have an activity watch to self-assess or even perform some physical activities, but also a watch that is beautiful wrist. Launched at 199.99 €, the Vívomove HR comes into frontal competition with the new Fitbit Versa sold at the same price. The Vívomove HR watch confirms its rather watchmaking design. On a black background, its stainless steel case (43 x 43 x 11.6 mm) reveals a simplified dial, with no visible figure, crossed by two hands only. The small one is made of steel, the large one covered with a luminescent yellow coating during the night. The absence of a button on the contours adds to the visual sobriety of the tocante which is recharged with the help of a proprietary charger in the form of clip-on clip. On the manufacturer's website , different versions of the Vívomove HR are available: with or without "Silver", "Rose Gold" or "Gold" finish; with or without leather strap. Some combinations place the watch at a price of € 299.99, instead of € 199.99. A two-line digital display provides access to measurements and notifications (here from a Nest Cam camera). Surprise: the Vívomove HR incorporates a perfectly invisible small Oled screen that "wakes up" when you tap the surface of the watch or when you look at it, but this second possibility does not work every time. At 0.38 x 0.76 "(9.6 x 19.2 mm), this black-and-white display can be manipulated with the tip of the index finger, which, by sliding on the surface of the dial glass, can The Vívomove HR is a reminder of the Nokia Steel HRand its small digital screen 1.1 cm in diameter with the same vocation as that of the Garmin. 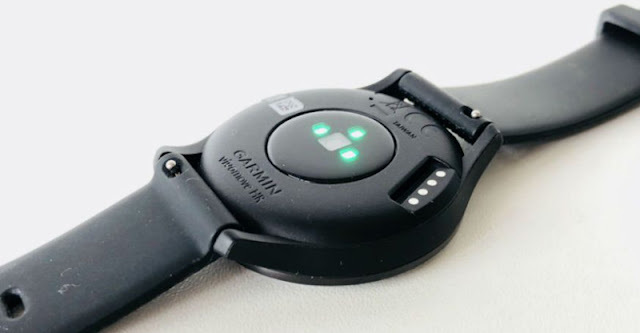 The Vívomove HR incorporates a 3-diode heart rate sensor, an altimeter (to measure gravis stages) and is waterproof; she does not have IP certification, but Garmin says it can be used for swimming. Regret: no onboard GPS. Finally, the Vívomove HR works with the Garmin Connect app (iOS / Android). Pleasant to wear, discreet and without ostentation, Vívomove HR is quietly live on the wrist. She regularly remembers her user and displays a " Move! " As soon as one has spent too much time idle. Its digital screen is personalized through the Garmin Connect app. We choose in the application the notifications that we want to see. We can thus select the information that we want to display: time / date, steps, floors gravis, intensive minutes, calories, distance. It is also possible to use Vívomove HR to play music on your smartphone. Our tests with Deezer worked perfectly but remain limited to the classic functions play / pause and previous / next track. Music control functions that work perfectly. 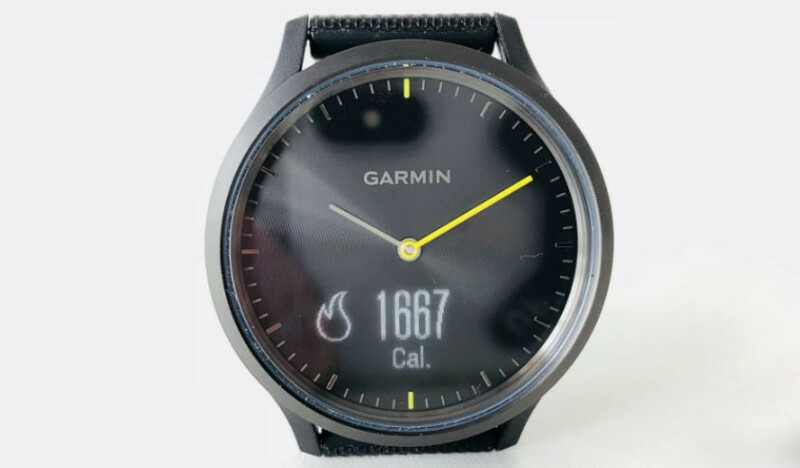 Garmin's Move IQ technology detects physical activity. It is not necessary to start measuring a small sport session for it to be identified. 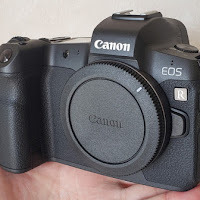 It works very well and offers a good feedback. For more precision, it is possible to start the measurement of an activity and to interrupt it from the screen. If the Vívomove HR is not positioned as a sports watch itself, it measures the VO 2 max, the maximum oxygen consumption during a given session. This index allows you to better adjust your training to your physical potential. The "smart notifications " (alert notifications) alert the arrival of an SMS, from"On Instagram, etc. The screen has only two small lines, it will be suitable only for short messages that can be scrolled by small patches successive. Alas, in full light the visibility of said screen is almost null and it is necessary to shade the dial to be able to read a message. Vívomove HR measures the heart rate continuously. 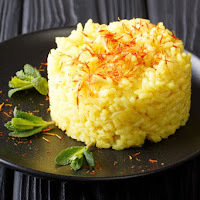 Among the measures oriented "health" that we have appreciated include the heart rate continuously, that of sleep, but also the level of stress. These different indicators, when carefully observed, help to raise awareness of some points that may be signs of health problems - for example, a high resting heart rate. It is unfortunate that these measures are not sources of personalized analyzes, or even alerts. 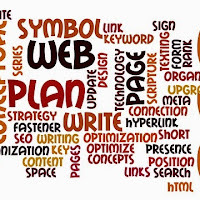 As it stands, it is up to the user to interpret them. The Garmin Connect interface, one of the simplest and clear on the market. 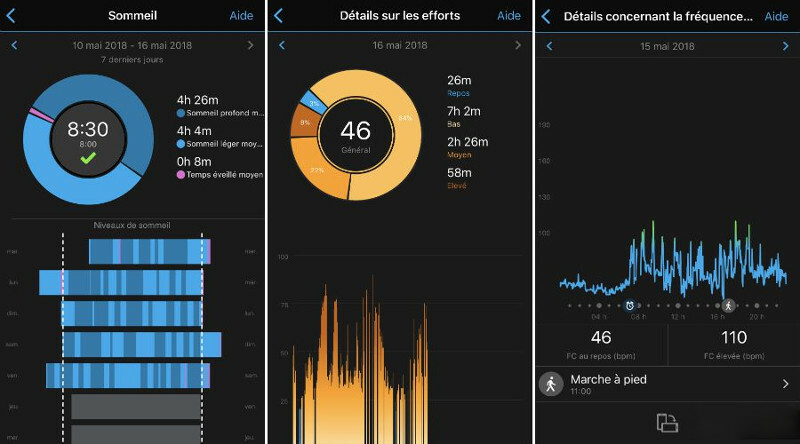 Clear, elegant, complete and rather intuitive (no need to wander through pages and pages to find the desired information), the interface of the Garmin Connect application is indisputably part of our favorites, along with that of Fitbit. A good point, especially when you know that a little over 2 years ago, its previous version was perfectly outdated in both its form and ergonomics. To learn more about the different aspects of Garmin Connect's latest version, we will invite you to review our Garmin Forerunner 235 test, which details the latest developments. We have worn Vívomove HR for 15 days. 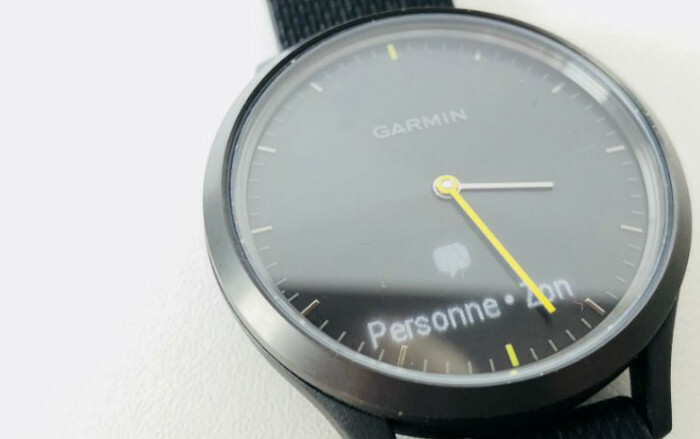 Garmin indicates that in use exclusive watch (without soliciting the digital screen), the autonomy of its Vívomove HR can reach up to two weeks. In "simple watch" mode with some daily notifications, our knockout has exhausted 90% of its resources in 5 days. A "Battery 10%" notification is displayed when power is running out. 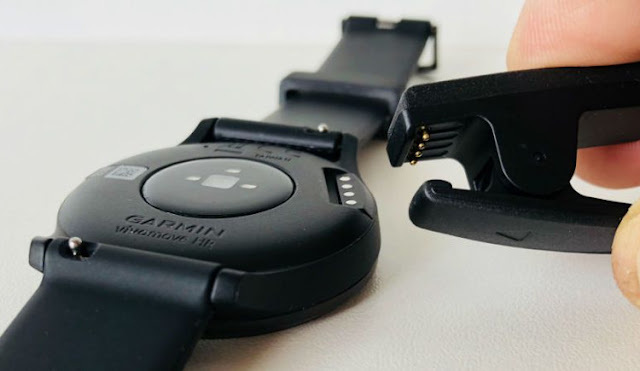 The Garmin Vívomove HR and its proprietary charger in the form of a clip-on clip. With two sessions of physical activity (30 minutes of running and 60 minutes of cycling), the Vívomove HR needed to be recharged after 4 days. A big charge is needed to recharge the batteries. Waterproof (can be used for swimming). Garmin Connect application clear and intuitive. Readability of the second screen in full light. It is up to the user to interpret the measurements. Between two categories: The simple activity sensors and the real sports watches, the Garmin Vívomove HR scores points by its sober but unifying design, as well as its rather advanced measures. Some perfectible points, including the readability of its Oled screen in the sun, and the lack of GPS, unacceptable for demanding athletes, however, should be considered before purchase.